Here are the main holidays and festivals in Thailand, as they are celebrated by the majority of Thai people (we didn’t include regional festivals or minor Chinese festivals). 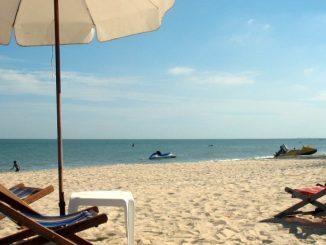 We have organized the list month by month, so you can easily check what are the main celebrations in Thailand while you are visiting. – Some holidays, especially religious holidays and traditional festivals, are celebrated according to the lunar calendar, so the date changes every year. 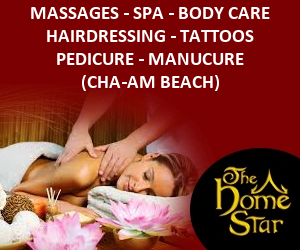 – If a public holiday happens on a Saturday or Sunday, the next Monday is a day off in lieu. – Election days are also public holidays. 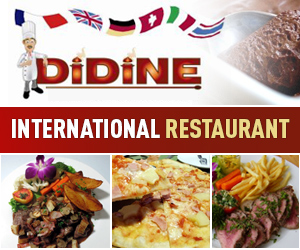 – The sale of alcohol is banned on election days and religious holidays, so entertainment venues are usually closed. Public holiday. Even if the traditional New Year is celebrated in April (Songkran Festival), the year changes on January 1st. Thai people start counting the years from Buddha’s birth, 543 years before Jesus Christ, but they also use the western calendar. So year 2018 is more commonly referred to as year 2561. If you are in Bangkok, the countdown usually takes place at the World Trade Center (Chidlom BTS station). Children’s day is celebrated on the second Saturday of January. On this special day many events are held for children, and parents take their children out, for instance to amusement parks. On Teachers’ Day, all pupils will pay respect to their teachers during a ceremony at school. In Thailand teachers are still very respected. Around 10% of Thai people are of Chinese descent, and the Chinese New Year is a big event. 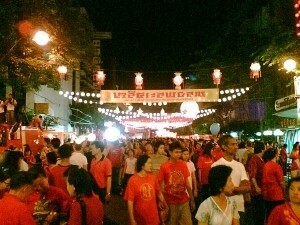 If you are in Bangkok, dress in red and join the celebrations in Chinatown! In a country where public displays of affection are frowned upon and young people are very shy about love, Valentine’s Day offers an opportunity to send a love card or ask someone out to dinner. It’s the most romantic day of the year! Public holiday. It commemorates the day when 1250 disciples gathered without prior notice and listened to Buddha elaborate some of his most important teachings in a sermon. Thai people usually go to the temple from early morning, participate in ceremonies, and at night they walk three times around the temple with candles. Public holiday. It commemorates the founding of the Chakri Dynasty, of which the present ruling monarch, King Bhumibol Adulyadej, is the ninth king (Rama IX). For more information, see our articles about Thai history. Public holiday. Thai’s traditional New Year, and the most important holiday of the year. Water is sprayed on statues of Buddha as a means of purification. If you are in Thailand, prepare yourself to get wet too, as Thai people also splash water on each other! Public holiday. This day commemorates the birth, the enlightenment and the entry into the nirvana of Buddha. Temples throughout the country are crowded with people listening to sermons about Dharma (Buddha’s teaching) and in the evening there is a candlelit procession around the main building of the temple containing the Buddha statues. Public holiday. Just before the Buddhist Lent day, Asahara Bucha commemorates the day Buddha preached his first sermon to his five first disciples. Beginning of the Buddhist Lent. The retreat last three months for the monks, who are not allowed to sleep outside their temple. Some people refrain from drinking alcohol, and there is no major festival until October. Public holiday. Birthday of King Vajiralongkorn (Rama X). Public holiday. The birthday of Queen Sirikit, who was born in 1932, is also celebrated as Mother’s Day. As the Queen was born on a Friday, and light blue is the color associated to Friday, people usually dress in light blue, to show their love and respect. On Sart Chin Day, the three realms of Heaven, Hell and the Earth open up for a whole month so that spirits can roam the earth in search of food and entertainment. People organize food offering ceremonies at home to make merit, and also distribute food and other necessities for those in need. Public holiday. Bhumibol Adulyadej the Great (Rama IX), “the beloved King and father of all Thai people”, died on Otober 13, 2016. The end of the Buddhist Lent. Monks are allowed to go out of temples, and people gather to bring them offerings of robes and food, in a ceremony called Thot Kathin, which lasts one month. Public holiday. Commemorates the day the King Chulalongkorn (Rama V) died, in 1910. Under his reign, Siam had become a semi-modern country, and had continued to escape colonial rule. Nowadays Rama V is worshipped as a semi-god, many people bringing offerings in front of his statues or portraits in the hope of having their prayers answered. Loy Krathong happens on the first full moon day of November. 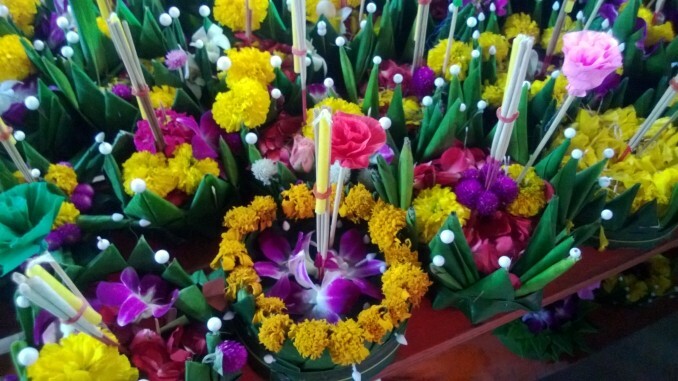 Thai people buy or make a krathong, which is like a small boat made of banana tree and banana leaves, with flowers and a candle in the middle. 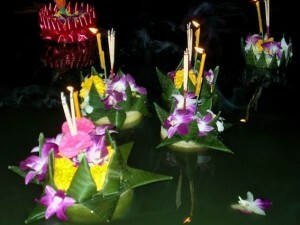 At night the krathongs are set adrift on a nearby river or pond, as an offering to the spirit of the water to wash away the sins. According to an ancient proverb, when a boy and a girl float a krathong together, they will be lovers either in this life or the next. Public holiday. Father’s Day honoring the memory of King Bhumibol Adulyadej (Rama IX), who was born on December 5, 1927. Public holiday. This day commemorates the first constitution of Thailand, which came into effect in 1932. It marks the transformation of Thailand from an absolute monarchy to a consitutional monarchy. Christmas is of course a Christian tradition and doesn’t belong to Thai culture. But Thai people love to offer gifts to each other, and Christmas, like elsewhere, has also become a commercial and marketing event. 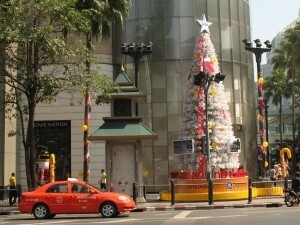 Not surprisingly, Christmas trees can be found in Bangkok’s shopping centers, rather than in people’s living rooms!